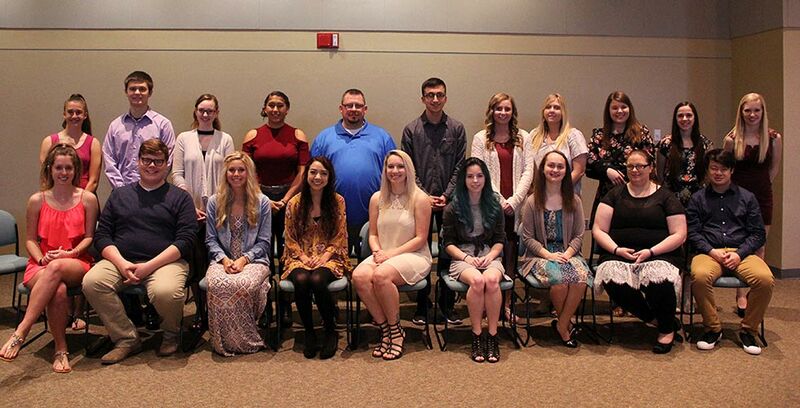 On Sunday, April 23, Alpha Gamma Upsilon, the Arkansas City chapter of Phi Theta Kappa, had its annual Induction Ceremony and All-Academic Team Celebration, officially welcoming 16 of 90 new members to the nationally recognized honors organization and venerating this year’s academic team recipients. A number of students applied for this scholarship in the fall, and through a series of essays demonstrating their leadership and volunteerism, two were selected from Ark City’s campus: Ashley Huslig and Kyndal Dutton, to represent Cowley College at the state level. The academic team, who were also honored in Topeka in February, were presented with Phi Theta Kappa graduation stoles and a gift. Their photographs will be displayed in Galle Johnson to honor their accomplishment. In addition, Kyndal Dutton, Vice President of Scholarship, was also honored for being named Coca Cola’s New Century Scholar, one of the 52 out of over 1,800 students selected from the All-USA Community College Academic Team. She could not be present because she was attending the American Association of Community Colleges’ 57th Annual Presidents Breakfast in New Orleans, LA as recognition for this award. Seventy people attended the ceremony that was conducted in the Brown Center’s Earle N. Wright Community Room by officers, Ashley Huslig, Abigail Garcia, Brittney McNown, Steven Lu and Deidra Shiever, and advisors Deborah Layton and Scott Layton. Guest speaker Amanda Krook, a former Cowley student and Alpha Gamma Upsilon president, presented the members with an informative and inspirational speech on leadership and achievement. Amanda spoke about how her experience in Phi Theta Kappa helped to propel her into some of her current successes. She will soon graduate from Newman University, where she has pursued a Bachelor’s degree in Diagnostic Medical Sonography. She was one of only five accepted nationwide annually into the program at Newman. Alpha Gamma Upsilon looks forward to future success as they select the new officer team for next year, and they appreciate the support they receive from administrators, the Board of Trustees, and the Cowley College Foundation for Endowment Scholarships.